The complete edition of the Centennia Historical Atlas covers over ten centuries of history as well as recent geopolitical events. Its geographic range includes all of Europe as well as North Africa and the Near East and MidEast. The map can be evolved forward and backward in time, fast or slow, displaying changes as frequently as every tenth of a year. Over 9,000 border changes in hundreds of wars, dynastic conquests, as well as political mergers and separations are included. Available for FREE. Download it and explore. Centennia Nations Edition includes the 150-year period from the beginning of the transformation of modern Europe in 1789 through the complete Napolenic era and the periods of nation-building in the 19th century and through the First World War, up to the summer of 1939, the eve of the Second World War. It's free to use. Teach from it, learn from it, and if you decide you need more centuries, the data are included in your download. Buy a license code at any time to unlock all the centuries before 1789 and after 1939 in the complete Centennia Historical Atlas. The Windows version of Centennia is a standard Windows desktop app, fully compatible with Windows 10/8/7 etc. It has low system requirements and will operate on nearly any Windows-based laptop or desktop machine built in the past ten years. The MacOS version of Centennia runs on any recent Mac laptop or desktop computer running OS X, 10.5 or later. Centennia has low system requirements. Note that the current executable is 32-bit and, on first run, your Mac may inform you that Centennia is "not optimized" for your computer. This is a harmless "nag" message from Apple and should only appear once. This does not affect performance in any way, and it is not related to device security. Current editions of the Centennia Atlas include text in Greek and German, as well as English. To change language while running Centennia, on your keyboard, hit "D" for German (Deutsche), "L" for Greek (ELLenika), or "E" for English. What a stunning piece of both pleasure AND education for all of us, i.e. for Daddy and for my kids 11 and 13. Unfortunately most people don't yet know this marvellous piece of edutainment. I hope this will change quickly. I have been using this program since 1999! I'd LOVE to see an iPad version as I teach 1:1 and have access to airplay. Thanks for keeping this program alive and available after all these years! How do I download the free version of Centennia Nations Edition? I do not see a link on the website. Thank you! I have been using this teaching my Modern European History class with great success. It always draws a little crowd when the map is left in free animation on a big screen! At last! I'm looking forward to using CENTENNIA Research Edition when my department completes the purchase ..... assuming we can fund it. Can you tell me: are the KML files compatible with Google Earth? Would I be able to show the historical borders of Europe, e.g., in 1499 displayed with the perspective and view features in Google Earth? Hello Ellen. I have added some sample views showing Centennia KML files viewed in Google Earth. Hello, Clockwork Mapping. 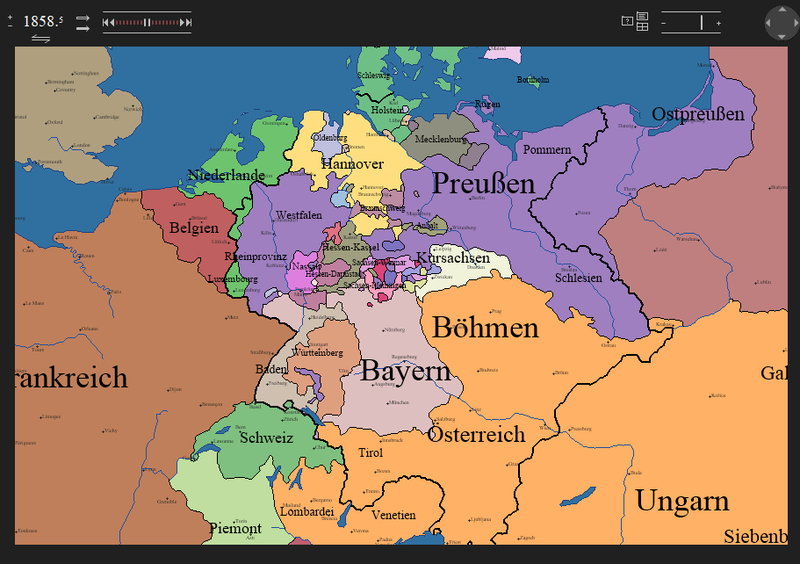 I use the MacOS version of your Cantennia Atlas, and I wonder if you plan to port it to iPad. I think it would be really *slick* on a tablet! Also, do you intend to expand it into the tenth century? My specialty is medieval France, and I would like to see more detail there. Just a wishlist! Thank you for this amazing atlas. Yes, indeed. We are working on an iPad version. It's mostly a matter of funding. The new "Research Edition" of Centennia will, we hope, provide enough revenue to get the iOS version launched. As for the other item on your wishlist --more in medieval Europe-- it's certainly a possibility in the next year if we can get enough interest. Thanks for letting us know what interests you! Your historical atlas shows details that I have never encountered anywhere else. I first discovered your maps through a viral video on youtube, and I was appalled to learn later that the video was published without attribution and violating your copyright. I hope you at least got some visitors to your site out of that. It's an astounding accomplishment and obviously a huge amount of research and artistry went into its creation. Can you email me and let me know if you have any deals for students? I would love to be able to assign this to my students in my European History survey class this summer. Thanks, Phillip Perry, Ottawa. Hi, Phil. Absolutely -- we do have discount pricing arrangements for students in classes, assuming you would be ordering ten licenses or more. We also have licenses for history departments and small computer labs/libraries. I'll email you. I can't tell you how much I LOVE this atlas. I've been using it for five years in my genealogy research, and there's nothing that compares. 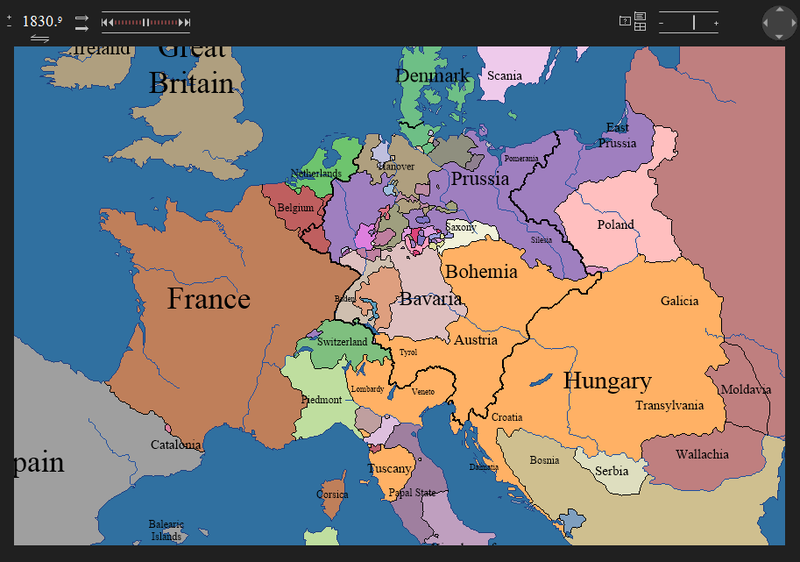 If I need to know what was happening in Baden in 1660 or Brittany or Danzig/Gdansk in 1925 or Milan in 1805 or anywhere else at any date... then I can turn to the "Centennia Historical Atlas" for insight. I only wish it covered more centuries, and I'm really looking forward to the version covering the history of North America. Thank you! home port: Conanicut Island USA. 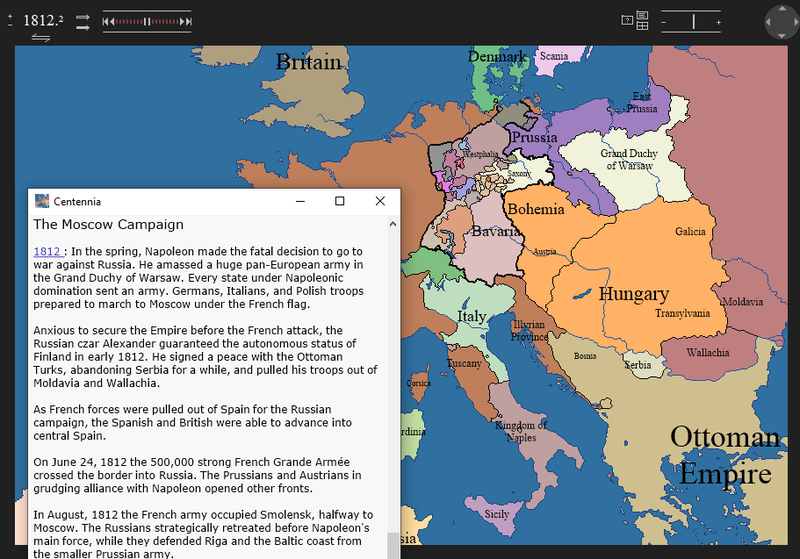 Centennia: Research Edition ($) extensive GIS versions of Centennia's primary historical database, CRE has been developed for academic research. Institutional licensing fees apply. 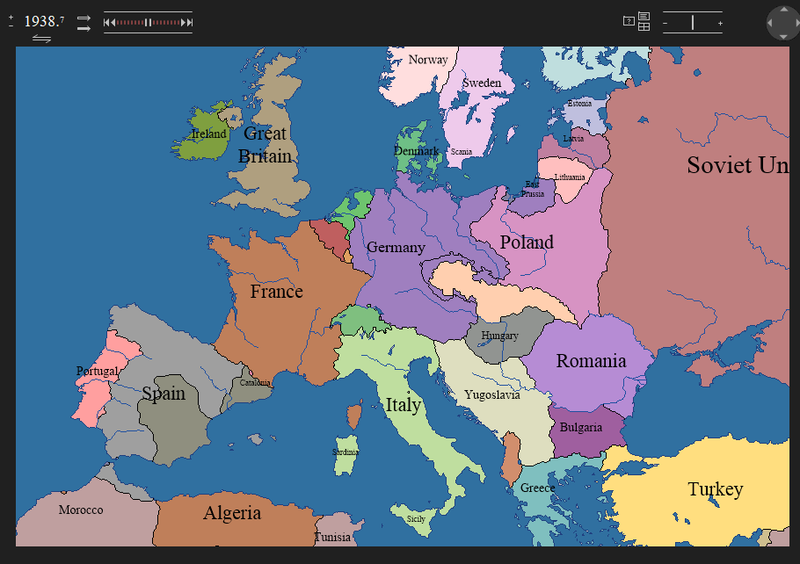 Centennia: Nations Edition 1789-1939 FREE. Physical copies now on USB flash (or CD-ROM). Get it here, by download or on USB or CD, or buy on Amazon: USB or CD. Review by Kevin Kelly, founder/editor of WIRED magazine. Frank Reed, Creator of the Centennia Atlas, guest expert on Neil deGrasse Tyson's StarTalk. Like us on Facebook: / HistoricalAtlas. 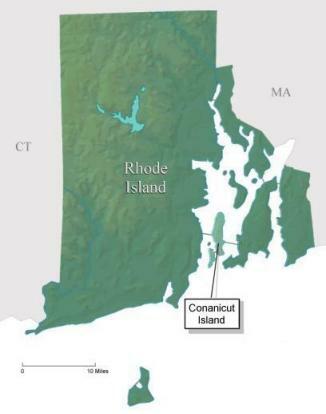 © Copyright 2019, Frank Reed, Clockwork Mapping, Conanicut Island USA. Your comment has been sent. We'll get back to you as soon as possible.